Real Madrid poor Laliga campaign continue as they suffer 1-0 defeat at Alaves on Saturday, marking their longest run without scoring in over 33 years. Alaves central midfielder Manu Garcia headed home after the ball hit the crossbar following a corner in the fifth minute of added time to send the raucous home crowd into ecstasy as Alaves climbed to third in the standings. 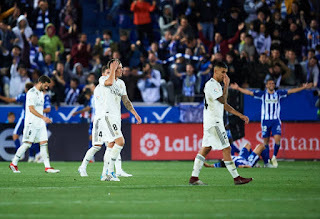 Three times European champions had been shocked by Alaves for most of the match and they were fortunate not to concede late in the second half before Garcia struck when Alaves Jony fired narrowly wide on the break. Alaves were the fourth team in a row to stop Real scoring and coach Julen Lopetegui will face further scrutiny with this defeat, which followed a 1-0 loss at CSKA Moscow in the Champions League, a 3-0 thrashing at Sevilla and a goalless draw with Atletico Madrid. Real madrid still top La Liga with 14 points after eight games but they could drop down to fourth if leaders Barcelona, Sevilla and Atletico Madrid all win on Sunday.